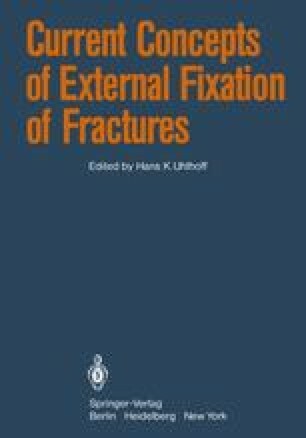 In 1950, the American orthopedic community was surveyed to determine the rightful place of external skeletal fixation in the armamentarium of fracture management (Johnson and Stovall, 1950). The majority of surgeons queried had tried and discarded external skeletal fixation because of concern for the complications associated with external fixators. Nevertheless, there is currently a surge of interest among orthopedists for external skeletal fixation. One reason for this is the increase of open fractures caused by high-speed motor vehicle collisions, especially among motorcyclists. Modern external fixators, while more rigid and more versatile than their predecessors, have not eliminated the problems associated with their use. On the contrary, the complications associated with transcutaneous-transosseous pins are ever present and are common to all fixators, past, present, or future.